As avid fans of Nicci French novels will already know, ‘Nicci French’ is the pen-name of best-selling writing couple Nicci Gerrard and Simon French. What I didn’t know until I read it on their Goodreads page is that both Gerrard and French graduated with First Class Honours in English Literature from Oxford University. I’ve been a fan of their psychological suspense novels for years, so much so that I set up a Facebook page to seek out other fans. I wanted to know who gravitated toward their work and why. Instinctively I thought they would be people like me, people who might enjoy what I liked to read and write. My own future readers, perhaps… if only I could learn to write as well as the Nicci French team. So what is it about their novels I find so compelling? One clue may lie in Nicci Gerrard’s professional background. Her first job was working with emotionally disturbed children in Sheffield, and an interest in mental health underpins much of the couple’s writing. In fact, I told a friend once that they seemed to create their characters by making their way through the DSM-IV, the Diagnostic and Statistical Manual of mental disorders. It was a joke, but it may not be so far from the truth. Each book, variously, has dealt with mental health issues, particularly the questionable human behaviour that results from severe trauma and abuse. From the start, Nicci French stories have had multiple layers. Sometimes the books are ‘murder mysteries’; other times they are portrayals of characters, usually women in their thirties, who are pushed to extreme limits; often they are a combination of the two. In the early novels, point-of-view characters are likely to be victims of some kind – victims of life, of their own behaviours and mental states, as well as victims of crime – and these experiences test their grip on reality. Avid readers of these books identify with the main characters’ fear of losing control, their journeys in stepping across the line between sanity and insanity. The books enact and exploit that journey, and also play on one’s fear of other people’s reactions to such a loss of control. In Losing You, the seeming ‘madness’ of the main character stems from her grief over the disappearance of her daughter. In Catch Me When I Fall, the main character is progressively depicted as an almost text book example of someone with Bipolar Disorder. Even in the more ‘crime’ oriented books, mental health issues are paramount. The perpetrators who victimise the protagonists often exhibit classic personality disorders. In Secret Smile there is a sociopath who targets and traumatises a woman who rejected him. In Killing Me Softly is a chilling and memorable portrait of a psychopath, one who displays the compelling ‘Dark Triad’ of Narcissism, Antisocial Personality Disorder and Machiavellianism. For people like me, there is a vicarious thrill in reading such stories. The interesting question to ask is why. Recently Professor Richard Landy, Professor of Educational Theatre and Applied Psychology at New York University, featured on an ABC All In The Mind program, discussing ‘drama therapy’ and the therapeutic effects of art. According to Landy, it’s all about ‘mirror neurons’. When we see something on stage (or, for the purpose of this discussion, read about it in a book), our brains behave as if we are the person engaged in the behaviour we’re watching/reading. We literally become excited, recognising in the characters portrayed something ‘human’ and ‘true’, and we experience this as therapeutic. But how could it be therapeutic to read about mental illness and violent crime, as we do in the Nicci French novels, conditions and events that would be deeply traumatising if experienced in real life? Landy’s discussion of the ‘framing’ of the drama/story, I believe, is pertinent here. In real life, circumstances only too often are out of our control: we can be struck randomly by illness, by events, by crime. There’s no come back, no cathartic sense of justice or happy ending. In a book or play, it’s different. By engaging with the fictional world, according to Landy, we enter into an implied contract with the playwright/author. In psychological suspense novels like those the Nicci French team writes, I’d suggest, the contract implies that we’ll be taken through our journey safely and both ‘sanity’ and ‘justice’ will be restored in the end. This is the pay-off for the reader: the illusion of control. For many readers – perhaps especially those of us who have experienced trauma or an intense sense of loss of control in our own lives – that illusion is very comforting. It’s like, in a way, we get to re-play being traumatised, but to experience an alternative, more empowering, less victimising outcome. Yet, this doesn’t tell the whole story. Not all of the Nicci French point-of-view characters survive being victims – and this uncertainty appears to be part of the suspense or thrill. The sense of risk, of the danger that this time things may not work out, would seem to be central to the pleasure the books create. The Nicci French team has been able successfully to exploit this desire for the illusion of control in their standalone psychological thrillers/suspense novels over a period of many years. In 2011, they changed tack, publishing Blue Monday, the first in a series which features a London-based psychotherapist, Frieda Klein, who teams up with detectives Malcolm Karlsson and Yvette Long to solve a crime. Since then, they have published two more in the series, Tuesday’s Gone and, most recently, Waiting For Wednesday. In starting this series, the couple has taken a risk. Instead of the creating a protagonist who embodies a victim suffering the vertigo of losing control, in Frieda Klein they have created a character far more cerebral. As this quote suggests, the emphasis of the series would seem to be more on understanding and articulating this world view, rather than dramatising it. Consequently, it would seem the reader has been robbed of the pleasure of a vicarious sense of loss of control. In its place is something far less visceral, less exciting. For the small group of dedicated fans who belong to my Facebook page, the reaction has been one of disappointment. As recently as yesterday, one fan who is looking forward to hearing the couple at the upcoming Edinburgh International Book Festival, expressed her preference for the earlier books and said she hopes to be able to ask the authors whether they planned to write any more standalone thrillers. A chorus of responses followed: these fans, it seems, prefer those earlier books. 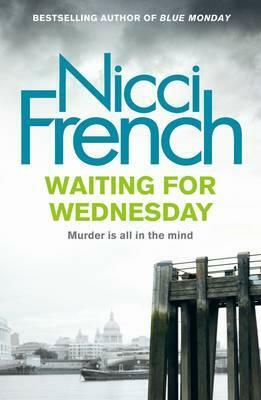 But what of Waiting for Wednesday, the most recent book in the series? The book starts out like a detective story, even police procedural. But the difference is that this mystery is woven in with Frieda Klein’s story, a story which has more resemblances to the earlier novels than the first two in the series. In this novel, Frieda Klein, a woman who loves order above all things, inhabits a chaotic, messy world, a world partly created by her semi-out-of-control friends and family, partly by her own actions. Once again she is a sleuth, but this time she is without the sanction of the police force. While her obsession to solve a crime appears to be a kind of self-therapy, or possibly merely a diversion as she fails to deal with the trauma she experienced in the previous novel, her sleuthing is seen by others as dangerous, even borderline psychotic. She has become, like the protagonists of earlier Nicci French novels, a woman living on the edge. Whether, for this story, the authors have changed tack in response to feedback from disappointed fans, or whether this was always going to be their trajectory for Klein is unclear. The result is that Klein’s world once again traverses familiar territory: loss of control, risk-taking, the appearance of madness, with justice and order – of a kind – triumphing in the end. The strategy may or may not be enough to convince dedicated fans, but the book certainly hasn’t disappointed other readers who have reviewed it so far (including two Aussie book bloggers, Shelleyrae and Bree). The path broadened out into a wide track. The river was slow and brown. If she lay down here, would she ever get up? …would she cry at last? Or sleep? To sleep was to let go. Let go of the dead, let go of the ghosts, let go of the self. Whatever happened to Nicci French? They tried something different and it works, for me. Ebook review copy kindly supplied through Netgalley by the publisher. Elizabeth, I’m always interested in arguments about the appeal of crime fiction, and Prof Landy’s theory is compelling. Thanks for sharing. I think you made a good case for applying Prof Landy’s approach to explain the appeal of crime fiction. I will borrow next time someone asks me to explain how to account for the popularity of the genre. Thanks, Angela. I’m always interested in hearing people’s theories, too. Thank you so much Elizabeth. I had always lumped Nicci French with Jodi Piccoult who I don’t read. I might have a look at the writing team’s work. Too busy to attempt a series though.